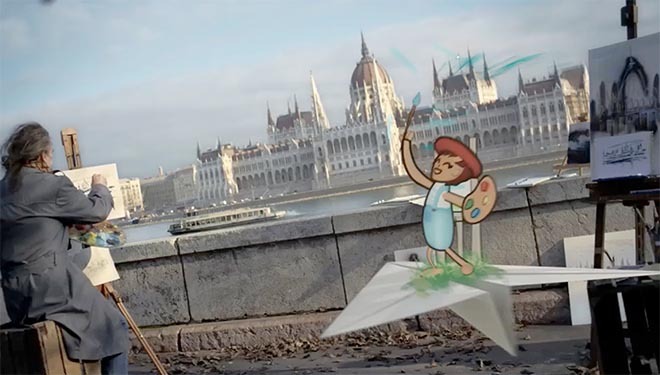 Chinese milk brand Monmilk has commissioned “Paper Planes”, a commercial in which children’s drawings are brought to life and sent around the world. Hundreds of paper planes containing a child’s dream travel to exotic locations around the world, from the Cappadocia Mountains of Turkey to the grand Opera Theaters of Europe. CGI paper planes and animations were carefully choreographed with the live action shots to show a seamless flow throughout. Tina comments “I wanted to portray the kid’s dreams as free spirited and able to travel anywhere in the world. Shooting most of the spot in Budapest we were spoilt for choice when it came to beautiful locations. The kids own drawings display a charm and naivety but I was also very conscious that the locations did not over power the simple illustrations”. The Monmilk Paper Planes campaign was developed at McCann Health Shanghai by executive creative director Kevin Lee, creative director Bai Xuefeng. Filming was shot by director Tina Bull via Luscious International with producer Tim Berriman and director of photography James Brown. Music was produced by Nylon Studios.